Ddraig Goch - the Red Dragon once represented the old Welsh God Dewi, who later became Wales's mythical patron Saint David. The Red Dragon represents the sovereignty of Britain, and is the totemic beast of the greatest line of kings, the Pen-dragons. Ddraig Goch has one talon raised in defiance! The Celtic Nations have a proud history of resistance, surviving many invasions (Saxons, Romans, Vikings) in the Western extremities Brittany (Breizh), Cornwall (Kernow), Wales (Cymru), the Isle of Man (Mannin), Ireland (Éire) and Scotland (Alba). 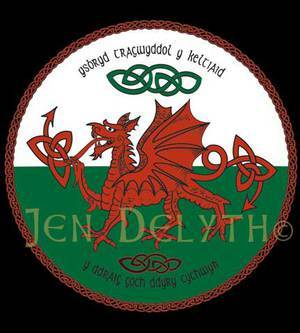 Ysbryd Tragwyddol y Keltiad - the Spirit of the Celts is Eternal! Saxon invaders, the Engles, renamed part of Britain England. Fortunately, St. George, patron Saint of England - who according to legend tried to slay the Dragon – has not conquered Ddriag Goch, who is still the official emblem of Wales. Y Ddraig Goch Ddyry Cychwyn refers to the ancient Welsh prophesy, that The Red Dragon Will Rise Again!